Saturday 2nd June. 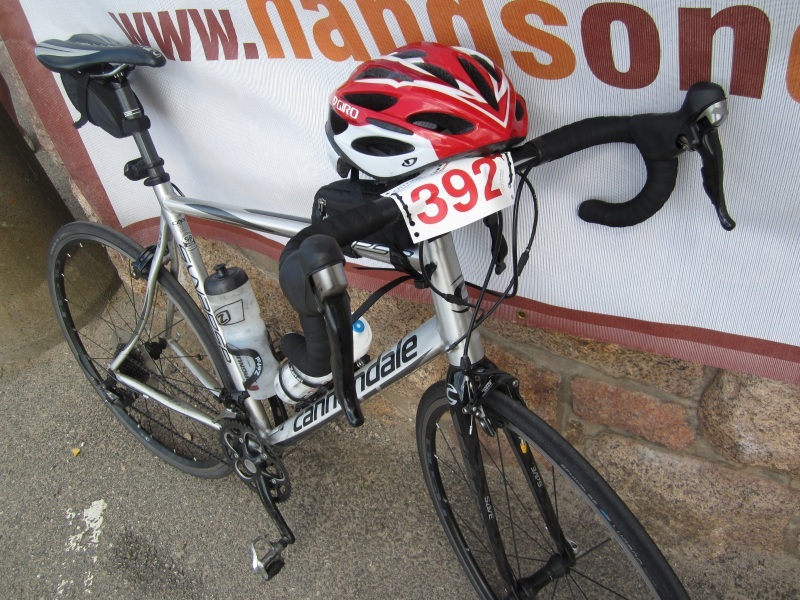 Aviemore-ish for the Cairngorm Classic sportive. 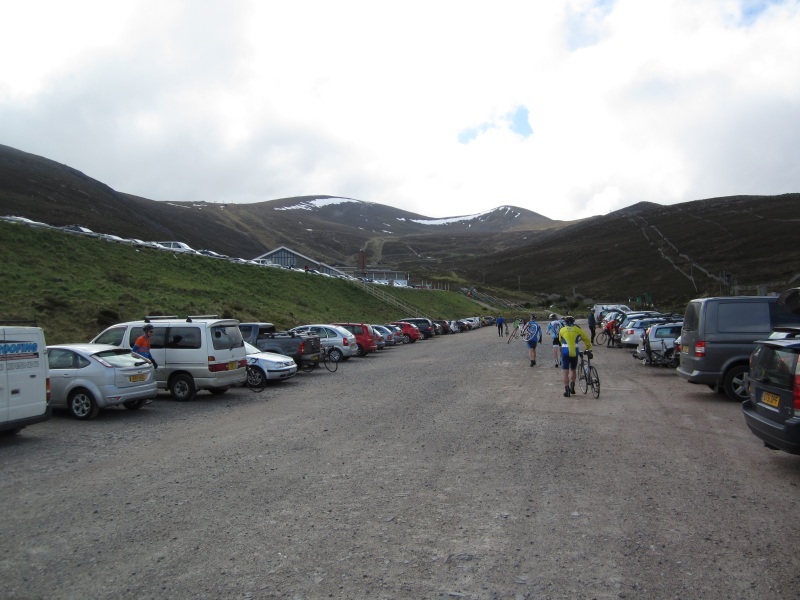 Some wag obviously thought that having an organised 100 mile ride in and around Aviemore could only work if they started from the ski-station car park. Which is at 632 m. On top of a mountain. We arrived in 2 cars, Bryan and Sammy in one, Big J and myself in the other. First thing we found after parking was that being on top of a mountain in June at 8.30am is decidely chilly. We were in summer gear, not our winter layers. Still, it was bound to warm up, or so we told ourselves as we checked in and picked up our ‘dibbers’ (timer chips you wear on a lanyard round your neck). We returned to the cars, swapped to cycle shoes, blew up my front tyre (the valve flew off, most irritating, needing a new tube), swithered over long sleeves/ leggings then made our way to the start. After accosting another cyclist to take our photo, we moved to the start, dibbed our dibbers and started off for about 7 miles of downhill, the air chilling us as we zoomed down the hill. It was hard not to think at this point that you’ll be slogging back up this same hill at the end, after having cycled for 90+ miles with 5 odd hours in the saddle. Smiles and “sunshine”. Its cold on that there hill. We split as we descended, Sammy vanishing in the distance, John slipping behind, though I could see Bryan just ahead of me. He stopped as the hill was coming to the end, wondering where John had got to, so I pulled over too. A big train of about 2 dozen cyclists whisked by, John yelling “come on” from within. Bryan and I shot off in pursuit, but had no chance of catching them. I think I struggled after the group longer than Bryan, but was soon in a smaller group on the road around Nethy Bridge, which was swallowed up by another, this second group had Bryan in its midst. 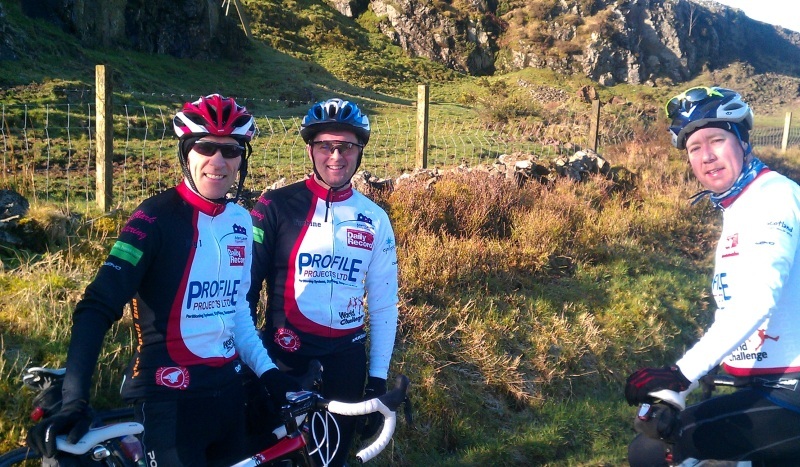 2/4 of our team back together as we hit a flatter part of the route. 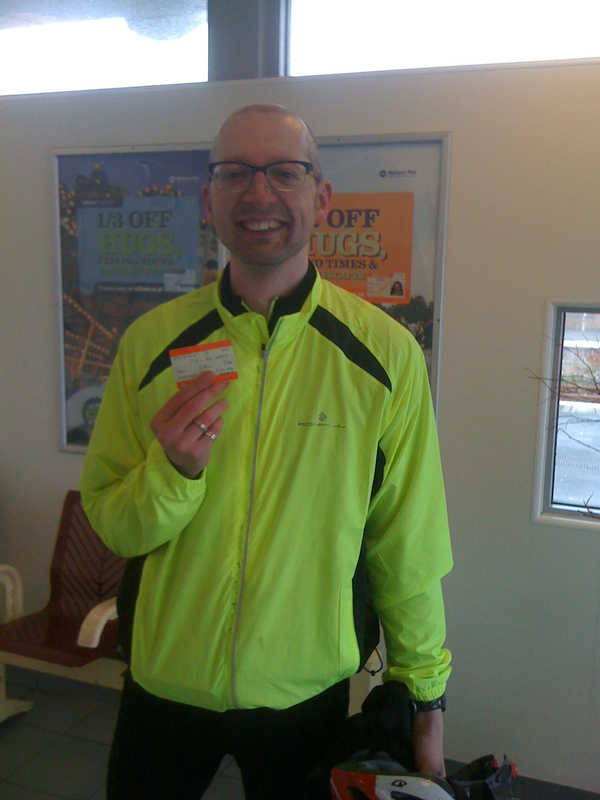 A few miles later, John appeared ahead, slogging it out solo and was absorbed into our train. 3/4. At about 20 miles we started a climb. I’d slipped toward the back of our train, and as we began the ascent the different climbing abilities of the folk to my side became problematic, 2 riders clashing, one coming off in front of me causing me to wobble into the verge to avoid falling on top of him, as he yelled his disgust at the other guy who’d swung accross and clipped his wheels. As a result of my near stop, I’d fallen off the back of the train, now a good hundred yards further up the hill. I struggled to regain the back of the pack, pushing hard to try and catch them, but working solo was hard going. I finally caught them, slotted in at the back, tired from the chase, just as we hit a steep hill. Not having any time to recover, I was soon adrift on the climb, and as the road split (50 milers left, us 100 milers to the right) I was again a good 100 yards behind on a slight incline. It was no use trying again to catch them, but I tried for a mile or two to regain the group before giving up. The next dozen or so miles I spent working my way along the route solo, hoping for a train to come by, but with no luck. The occasional fellow solo rider or duo would appear ahead of me, but few if anyone came by me. I soon hit a feed station, and being on my own, stopped to grab a few cakes, hoping that I could pick up a group, but most other folk arriving were in ones or two’s. I set off after a minute or two, slogging on, sighting an orange top in the distance as a target. As I approached him, another rider slowly worked by me, so I tagged on his tail. He moved out immediately, looking back at me unhappily, so I backed off and let him go on. Odd fellow. Shortly after, a group of half a dozen Dunfermline CC started to overhaul me, so I asked if I could join, which they were happy to allow. Two of their group were around my level, the others either tired or less able when it came to the short climbs, so I put in my fair share at the front and we made good progress once I’d worked out their odd system (starting at the back they’d move to the front, overtaking the train on the outside before settling on the front, soon followed by the man behind). There was little chit chat, but a good atmosphere between them, and we worked together for a dozen or so miles until we hit the next feed station at around the 60 mile mark. Here the others were waiting (20 minutes it seemed), I thanked my temporary team-mates for the previous miles, and quickly grabbed a few bits of millionaire shortbread and a banana before we set off as 4/4 Team DIFD. We worked as a team up the hilly section that followed, pushing hard into the wind, on the drops to avoid as much wind as we could. We were making good time, overtaking many solo or duo riders as we went, the only event of note was my chain deciding to jump off as we piled down a hill which was soon sorted. Just after Boat of Garten a “10 miles to go” sign signalled that we’d soon be on the final stretch (uphill all the way, joy), and the DIFD train had picked up a couple of extras. One kept with us as the route began to slope upwards, taking his turn at the front (but pushing a bit too hard) as we slogged on. As the hill began proper, I was done, my earlier efforts trying to catch trains and solo-ing so many miles taking their toll, so I told the rest to go on. I could see them working their way by a few struggling folk as I followed slowly, still overtaking a few other cyclists myself as I went, with the occasional person walking up the hill. As I crested the first rise, took a quick cakey break (been carrying all that food, may as well eat it before I finished) andgrabbed a few quick photos before zooming up the last few bits of hill (cake power!). Overall, a hard but fun ride, 17.6mph average, around 5:35 hours to do the 98.2 miles for me (the others around 20 minutes quicker). done. Now where’s me free pasta? The Sunday outing – emails had been flowing during the week discussing a coast to coast in late June, which then turned into debate over a Lakes ride instead and ended with the decision of doing a “Fred” (named after Fred Whitton, turns out this is a 112 miles ride of 9 peaks, some hitting 15%+ – no easy feat). The end of this email exchange also sorted Sunday’s training ride, a plan to take in the Dukes pass run with an extra 50-odd mile extension via Crieff, for a 120+ run. This time there was the promise of a lunch stop. As this was going to be a long run, and the lunch stop was going to be timed to meet non-cycling family, needed to be up at silly o’clock for Big J picking me up at 7am for the start at 7:30 from the ‘club house’ (Gio’s place). 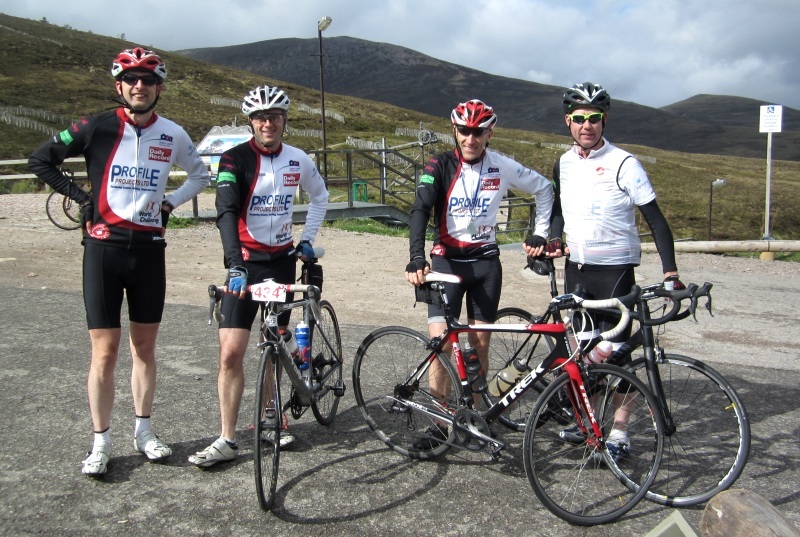 We started as a 4 man group – Bryan, Gio, John and myself, with Gio intending to join us for the first 40 miles or so. The first 20-odd miles flew along, even with the wind against us we were easily topping 18mph average as we hit Aberfoyle and the climb up the Dukes pass. We rode up as a group, with only the last section splitting us slightly, Bryan dropping back a short distance. I barely had time to take a few snaps before he was with us, “I’m not a climber” as he pulled alongside. The descent went without incident, the only traffic a bus toiling upwards, giving us plenty of room as we streamed by. what you doing right on our tail at the top? Just after the 40 mile mark, a quick stop for farewells to Gio, as he turned toward Callander and home, the three of us continuing onwards to Strathyre. The road rolled for the next several miles, the sun growing stronger and the shadows it was casting through the trees making it hard to distinguish potholes from leaf patterns adding in the occasional clunk and jolt to the ride. 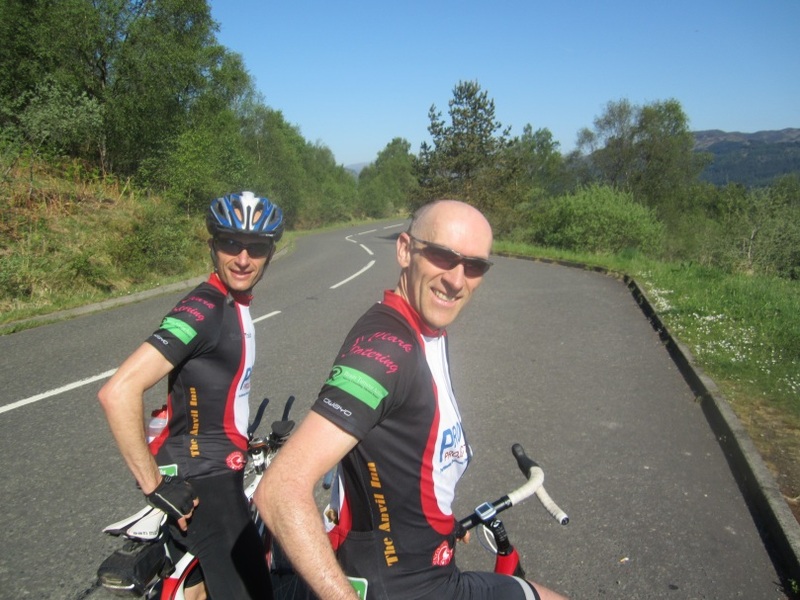 John took the pace, holding us steady for a long stint, switching back to turn-about as we passed by the glassy calm of Loch Lubnaig, the shores dotted with folk enjoying the early sun. 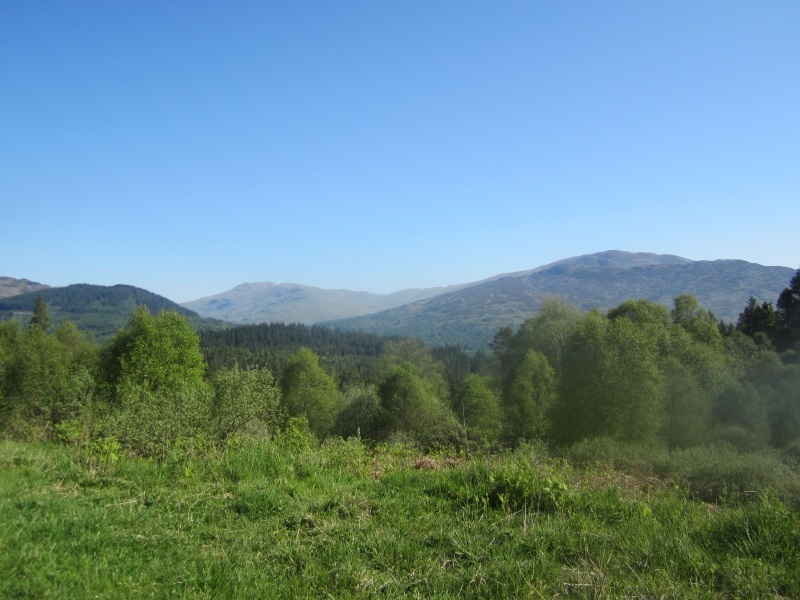 We were making good time, enjoying the excellent weather and were soon turning along the A85 at Loch Earn, passing campers and day-trippers scattered along its edge, with barely a hill to be seen. 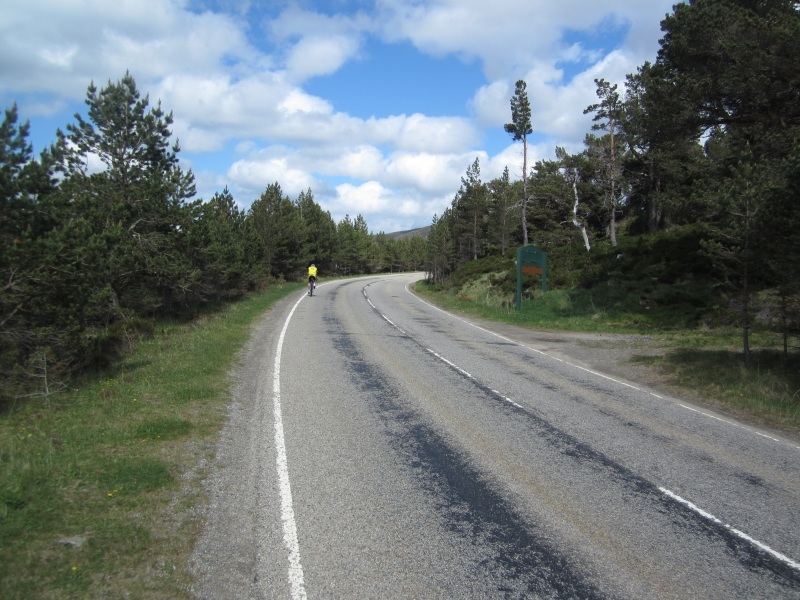 The nice level tarmac saw us to Comrie (home to a fine golf course) and it was only another 10 or so miles to Crieff and a welcome stop at Yann’s. 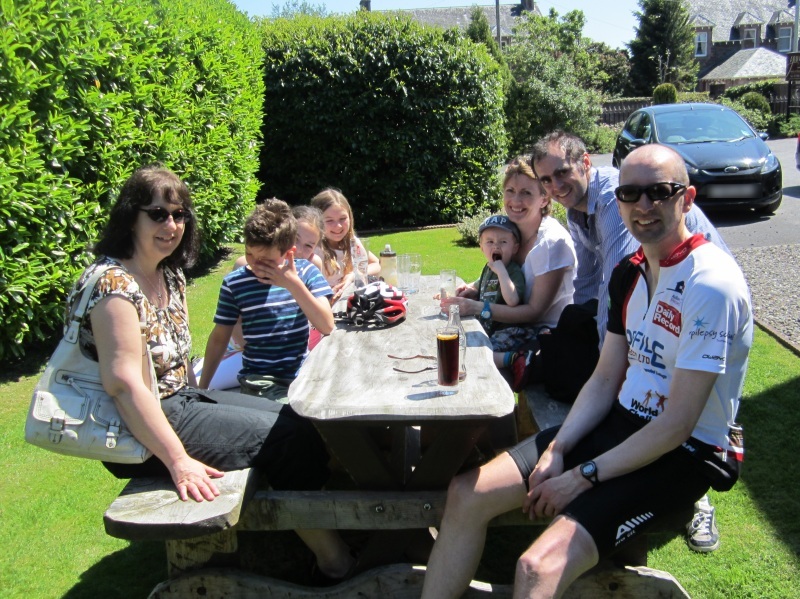 We sprawled on the grass or at the table and were served coke and iced water by the friendly staff while waiting for Bryan and John’s other halves, enjoying the sunshine and break from pedalling. They soon arrived, and we sat down for a fine lunch – not quite a cake stop, but just as good: onion soup with a cheese topping followed by rump of lamb with minted-peas and chips for me, others partook of mushroom soup, black pudding salad, Arbroath smokies with mains of La Potee (Toulouse sausage & ham broth), fish pie and eggs Benedict; the kids tucking in to fish gujons, lasagne and chips. The only slight downers to this fine feast were the grumpy folk at the next table over-reacting to the excited children, and having to pass on dessert from being stuffed. Bottles refilled, we said our goodbyes to the families, and hit the road for the remaining miles. 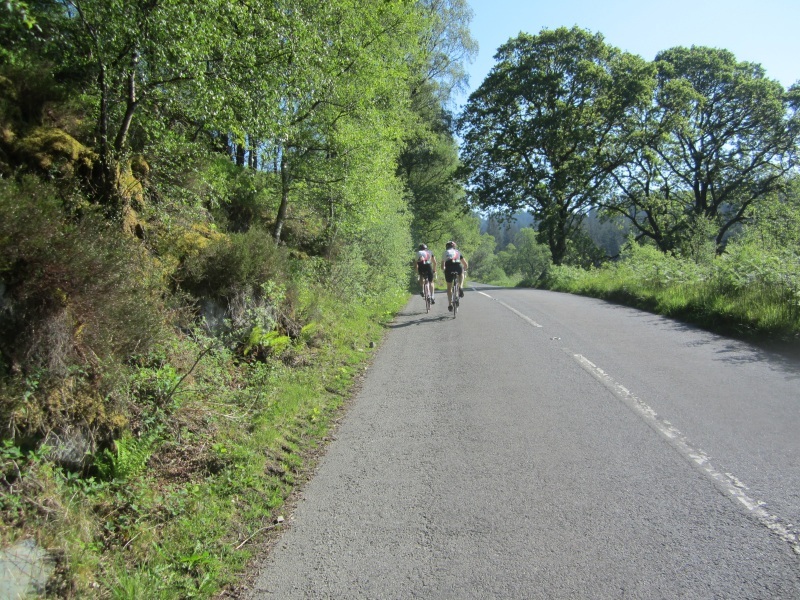 A steady climb taking us through Muthill, then down to Braco and to Dunblane before turning off to Doune. Here we made a short stop to grab some energy drinks, the chilled water in our bottles (well, mine and Bryans were iced by the folk at Yann’s, John had refilled from the tap) already warm. The temperature in the small square was hitting 33-34°C according to my Garmin, as I tapped in our target of Kippen into its GPS, getting us on our way to Thornhill and the hill beyond. We rode up the first section together, John and I pushed on a little harder on the next steep section, but by the summit we were all together again for the descent down into Fintry and the Crow Road hill. We trundled along the flat section, John announced himself ‘done’ but as soon as the climb came into view, he forged by me. My ‘thought you were done?’ was replied to with a ‘last throw of the dice!’ as he stood on the pedals into the corner and pulled away. I stuck to my pace, sat on the saddle, feeling ok considering the 110 miles we’d now completed and just kept turning the cranks. John was still in sight, standing at every turn, but I was beginning to reel him in. Feeling a bit short of energy (the lamb and magic minted-peas wearing off!) I struggled with my pack of Zip-vit sweets, trying to pry the now sticky, half melted goodness out of the bag while maintaining my momentum. Eventually got one out, chewed it down, and returned to focussing on John’s back wheel in the near distance. After a few more minutes I was in touch, with not far to go to the summit. “Where’s Tubs?” he asked, “not sure” I replied, and we moved on together. 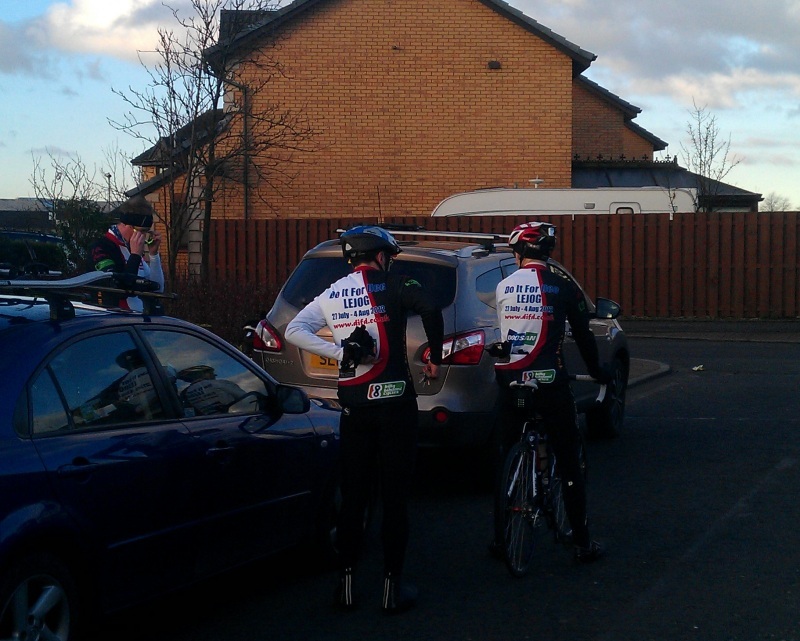 We stopped at the top, Bryan soon appearing, and we waved him on, then followed for the ride down into Lennoxtown. I missed my clips as I started off, the others were fast vanishing as I finally got my left shoe in, so I was playing catch up down the hill. Pushing hard, I glanced down at my Garmin, to see it reading 45mph (!) scaring myself a bit, so eased off as I passed the car park and the turn. The wind soon put paid to any speed I was carrying, and I could see John and Bryan ahead, folded over the bikes as they disappeared from my view round a bend. I caught them at the bottom, waiting for me at the turn. John lead us for the next section, but as I swapped to the front, I offered to take a longer stint, to which there was no dissent. Strangely still feeling strong, I pushed on, the others hanging on to my wheel for a change. Stopping only for lights and junctions, Bryan asking if I’d been on “the EPO”?, “nope, just feeling ok” as we completed the final miles back to Gio’s to pick up the cars. The only momentary struggle on the final short hill before home, I was well pleased to have been able to return the favour of many a ‘carry’ for the last miles of an outing! A sterling ride by us all, 127 miles done, a proper “LEJOG” distance completed in around 7 hours, average 17.6mph. Sunday. 6am. The things I do for this cycle training malarky. 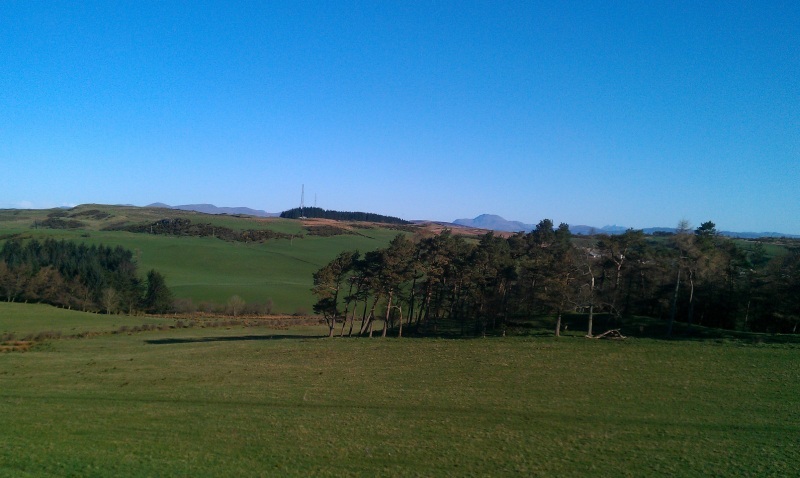 Up and at ’em to get round to the starting point for the day’s cycle to Largs (remember the train?) – Big J’s house. So I’m getting in an extra 6 or so miles as a ‘warm up’ by cycling over to his place. When I arrive (a couple of minutes later than the 7.30 start time) everyone’s getting kitted out in the new cycle jerseys which arrived a few days before (John, Sammy and Brian). A smart looking team get lined up for photo’s, with poor Niamh (Big J’s 11 yr old) roped in at this early hour on Sunday morning as photographer. A few “drive-by” photos and we’re ready to go, except John is having some sort of issue, and is in and out the house for bits n bobs. The rest of us, getting a bit chilly standing (sitting?) around waiting head off, knowing he’ll soon catch up. I lead off, calling behind for directions as I’m not sure which way we’re going (Largs is somewhere I drive to. In a car on motorway/ dual carriageways. Which is sensible, its quite far away). We’re soon working our small train of 3 well, setting a good pace and its not long until we’ve left the more built up areas for the countryside. Brian and Sammy are not happy at the spatter from the occasional puddle/ damp stretch of road soiling their pristine new jerseys, but I’m not paying much attention as I’m starting to wonder if I overdid the training this week (3 pacey 6 mile runs and two 15/18 mile cycles). The first incline of any note and I’ve dropped off the back. They wait at the top, and we get to admire the view – the sun is out, though its still chilly – as John appears a short distance behind us. He goes to pull out his camera, but can’t find it in any of his pockets – he has the case though. Has it fallen out on the road? A quick phone call home confirms he actually left it behind, so camera phone it has to be. John’s new carbon Trek is ‘not feeling right’, swapped wheels and tweaked handlebars are not what they should be, but some road-side mechanicking from Sammy seems to do the trick and we’re good to go. A short post bike fix break. And its sunny. looking the other way, blue sky. I take off a little ahead of the group (chance to go a bit slower til they catch me up), but have only gone a mile or so around the loch and there’s no sign behind, so pull over, grab my phone and take a few piccies at Loch Thom. Sammy and Brian round the corner, but John isn’t with them. He turns up moments later, something not right with his gears now. More quick fixes and we’re off again. The road gets a bit hilly and I’m starting to regret my sub-40 10k on Monday, and drop behind the rest again. 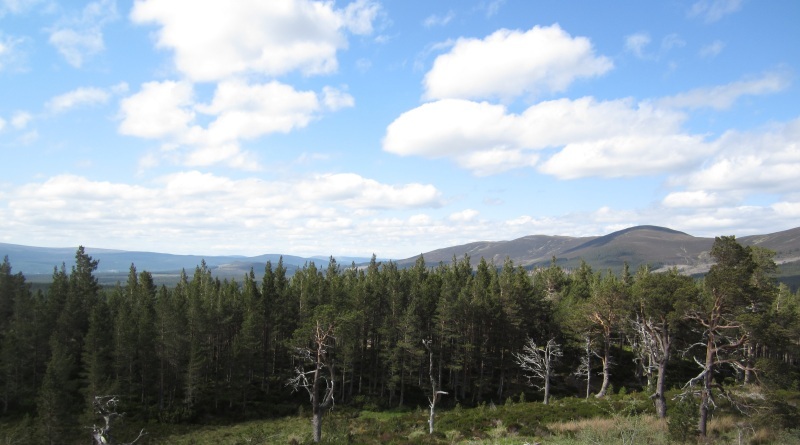 But its not long before there’s a good downhill stretch and not being with the group is of little consequence – the road down in to Greenock is steep and allows for a good turn of speed. 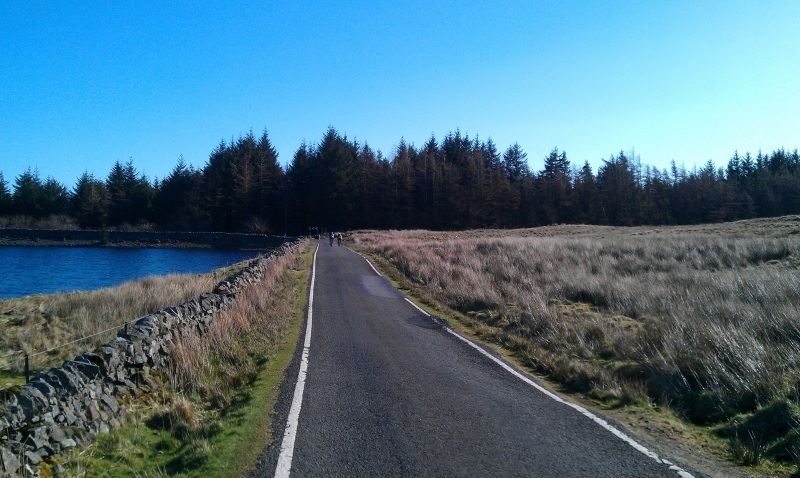 We regroup at the bottom, and I refuel on a Torq bar, a gel, a few Zip-vit sweets and wash it down with some lucozade. There’s a nasty little ‘thigh-burner’ coming up and I want to be ready for it. We set off, the first left turn is up a fairly steep hill, then a right up a slightly easier incline (I’m dropped, again), left twice more before the wee bugger of a hill I remember from back in January. At this point, no-one is in sight, but I recall school shot-putting practice – I was rubbish, but a fellow pupil from my athletics club (a chunky thrower) recommended grunting will get you an extra few feet, so decided this must translate into hill climbing, go all Sharapova and grunt my way up the hill, putting in a decent (for me) turn of speed to reach the summit. We travel on and down into Largs without incident, though I seem to lose touch with the group with regularity, we regroup outside the ice-cream shop. A snack break, then a few photos of us looking dapper in our team kit with the seaside behind us (though I’m too busy snacking to get my camera-phone out), and we take off towards the next challenge – the Hairy Brae. We are instantly put at a disadvantage, the lights are red at the start of the climb, forcing us all to start from a standstill before we can push upwards. I stick to the group for the first section, but am soon left behind, and a lorry gets between me and the group, causing a concertina of traffic behind it. I’m tempted to hang on to its trailer as it passes, but decide thats probably not the best plan in the world. No way am I stopping on this hill, so just keep plugging away, hoping the vehicles will get by without bumping me or the leading group. The lorry eventually gets by and the other traffic thins out, the climb continues, and I give a few brief attempts at upping my speed by standing on the pedals. This works out ok, so try and work in a few more ‘standy-up’ bits as I continue upwards. As the incline lessens, I start to speed up a little, trying to remember how long it is to the top (you don’t really pay attention to these things when you are driving the car along). I glance up along the now straight road, to see Mr. Whitevanman hurtling towards me on my side of the road as he overtakes a couple of small cars – I’m not liking the look of this, the road isn’t that wide, so move as close to the gutter as I can, and am missed by feet, though it feels much closer as I’m buffeted by the van as he zooms by and I offer him some unheard driving advice and a few choice words of abuse. The top comes soon enough, and the rest wait in the roadside parking bay, arguing whether a 54/25 or 26 (28?) is the way to go. I’ve no real idea what they are on about (something to do with gears/cog sizes I gather), so just take the opportunity to slug back some juice while they come to any sort of conclusion. We set off in a train, the rolling of the road is such that I’m able to keep pace comfortably, and we pick up a roaring pace as the road takes on a combination of level and downward slopes, with few upward sections to slow our progress. At one point I find myself at the lead, zipping downhill and unable to keep up with the pedals and no bigger gears left. Realising the futility of continuing pedalling when I’m not actually achieving anything, and the slighly scary speed we are at (knocking on 40mph) entering a corner, I stop pedaling. Apparently this is bad form, to which John yells – keep pedaling! so I do, to little effect other than looking like I’ve a vague notion of what to do. I guess I need another cog somewhere for these odd speedy bits. 28? The pace settles down as we pass Kilbirnie before another ‘hill’ is to come (around Lochwinnoch) after which I’m warned we take a right turn on the downhill. The “up” doesn’t take long to spread us out, and its not much longer before I’ve lost sight of the team again. The ‘hill’ seems to be over and there’s no sign of a right turn or in fact anything much other than traffic cones on various bits of ‘road closed except for access’ sections. I occasionally see road bike tyre tracks leading out of puddles so think I’m going the correct route, but begin to wonder if I’ve somehow missed a turning somewhere along the way. I’m not that bothered, as I’ve a vague notion of where I am, as I’ve a recollection of being round these parts in the pouring rain/ wind with Mark M a few weeks previous, so tootle along regardless, with a plan of working out a way back home solo if need be. My concerns are soon over, as I hit a downward section, and can see a few black and white jerseys ahead, as the three others wait in the promised right turn. We regroup, as a couple of other cyclists head down the hill I’ve just come down, the second yelling to his friend to ‘go right’ as he zooms on oblivious. We have a short conversation, offering ourselves as a target for him and his buddy once he realises he’s missed the turn. We set off again, and I’m struggling to maintain contact, but notice I’m averaging just around 15mph over the route as we head into Bridge of Weir. 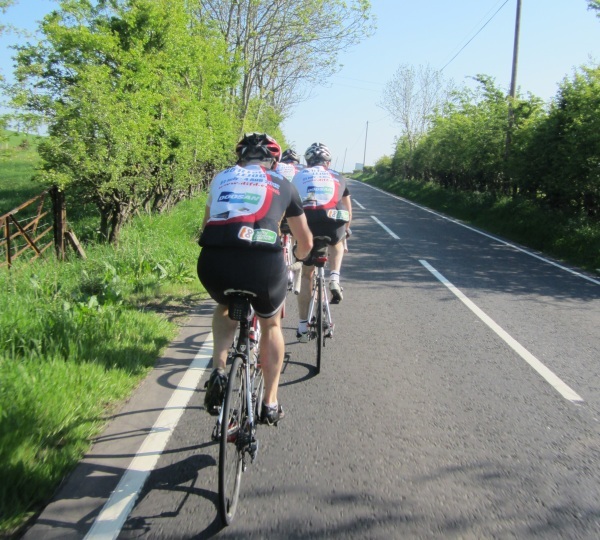 The road flattens out, the team keen to hit their target 17mph average, but I’m fading and not up to their pace. However, I’m still keeping my own pace well above 15, so am happy enough on my own, though regretting not hanging on the back a bit longer as I’m not really sure where I’m going. I soon see a junction ahead signed for Paisley to the right, Erskine left, can’t see the guys, so reckon Paisley is the way for me (it isn’t). As I close in on the junction, I see them on the left, so slow to a stop. Left it is. A squad of purple/blue clad cyclists come by as we discuss my proposed route (apparently the Paisley road way ‘wouldn’t be fun’ and ends up on the motorway), one of whom plays with the oncoming traffic on the wrong side of the road eliciting a few angry beeps from a car. We turn left, and I tuck in behind John determined to hang on for the last few miles. We hit a roundabout, and it seems Brian has been left behind. In the team spirit of the moment (polite translation of what passes between the guys – “he’ll catch us up”), we forge on, but John and Sammy’s pace is proving hard to match. They leave me on a slow climb, but a dozen or so of our purple/blue friends appear behind me soon after, so I put in a surge to latch on to the last in the group as they come by (Mark M’s words of “closer” echoing in my head). Now this is more like it. I’m barely putting in any effort, and am cruising along at the back of this three-wide group. Bliss. Sadly this easy going is short-lived, as they all turn off, bar one, a short distance along the way. I thank them for the tow, and try to hang on to my new friend, who has spotted John and Sammy ahead, and has upped his pace to catch them. He reaches them stopped at a set of lights lights. I start to get into range just after the lights change and they’ve surged off, but 70-odd miles are taking their toll and I can’t match their speed. I drop off before making contact, but am not that far behind as we near the round-a-bout leading to John’s house. Purple/blue goes straight on, J&S turn right, but I’m not going to catch them now. I roll up to John’s slightly ahead of Brian – turns out he couldn’t get clipped in back at the Paisley/Erskine turn and was playing catch-up all the way, missing out on the tow-advantage of team purple/blue that I was lucky enough to get. Top result for me – 15.5mph average, 72.08 miles. My best average to date and my longest ever cycle in the bag. And even better – no train-ticket required. More photos (proper camera not my basic phone one will hopefully come via Big J), carrot cake (thanks Mrs. Sammy!) chit-chat about the day, and then I take a ‘recovery’ ride for the 6-miles back home. Sunday. 9-sh. This week I was in town, so headed out with the team for a training run on the wheels. Cycled round to John’s (6.5 miles or so) without incident, barring John’s friend Joey’s cousin, Frank, who followed me for half a mile before jumping a red light to go by me – not that I was racing, as I was happilly pootling along minding my own, saving my energy for whatever was to come. My Garmin 205, strapped to the handlebars with cunning use of an old light mount and a rubber strap from a mudguard I never used, had my average on this pre-training section at 16mph, not too shabby. Three of us hit the road, John, Gio and myself, our exact route a mystery to me (as always) but starting with a steady run out of Renfrew and into the countryside proper. Bananas and sport gels stuffed in my pockets, along with a trusty Mars bar and a new, second bottle cage taking my on-board liquid count to 1.5L or so, I was prepared this week for refueling on route. The pace was fine for me, taking one stint at the front, but spending most of my time behind the more experienced riders. This has one drawback – wet roads. If you’re thirsty and not fussy about what you drink, you’re well catered for, just open wide and you’ll get a steady stream of gunk from the wheel in front. If not, you’ll be steadily bespeckled with road mank. Still, its all part of the fun of winter training. On we went, hitting our first hill of the day, me into the lowest gear I have and taking it easy, J&G zipping ahead as if the change in gradient wasn’t there. No real issues, taking on a bit of lucozade as I climbed on, knowing they’d be at the summit, wherever that was going to be. 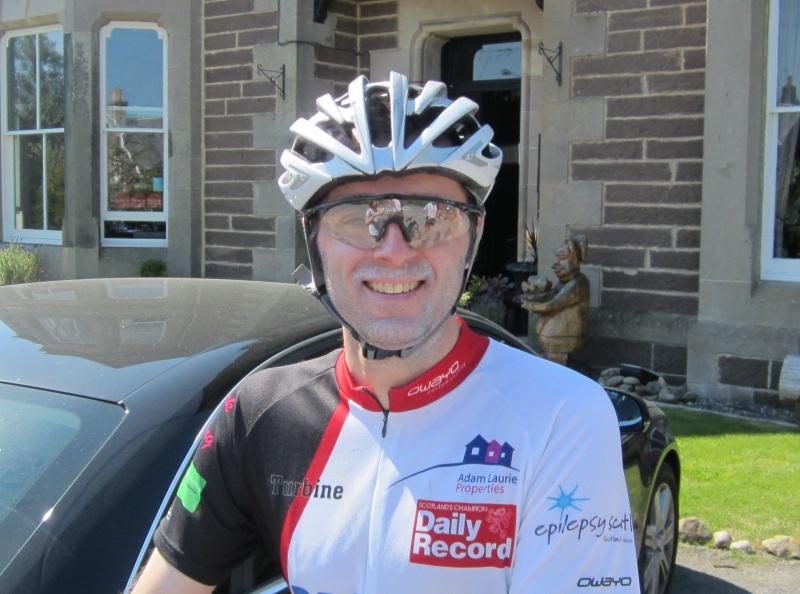 In the end, it wasn’t too bad, so on we went through Kilmacolm and skirting round to Greenock for a cracking downhill section, hitting a record-for-me 37mph (though the uploaded data lists it as 36mph, meh) . My euphoria didn’t last long as a quick break for refuelling had J revealing the ‘next bit has a bit of nasty climb, its not a long one though…’. Hmm. First bit of the hill was ok, leading to a thigh-burner, which was thankfully short enough to manage without running through all of the fine selection of expletives I’ve learnt from my many years in Glasgow. 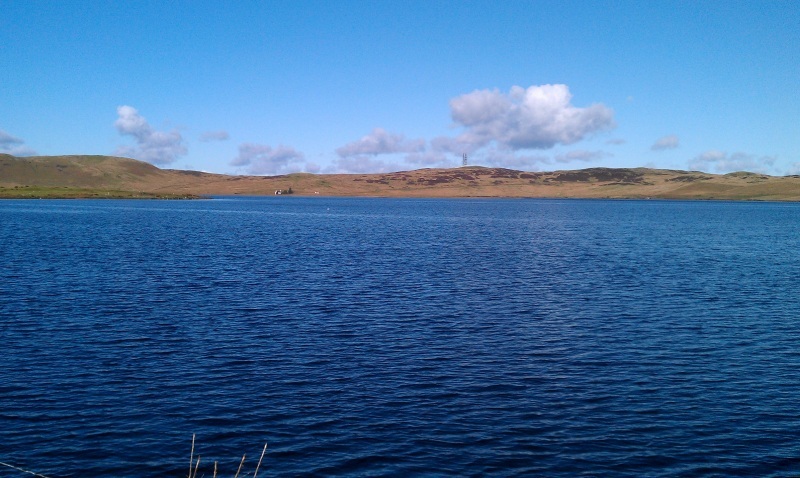 Past Loch Thom and I’m starting to enjoy this cycling lark, great views and the terrain, though undulating, a bit more forgiving and no more thigh-burners. The team slipped ahead, waiting for me at the top of the last rise, chatting to a local + dog, leading to another great downward section to Largs. Now, I’ve been to Largs a few times, in the car. The main road is a ‘select low gear’ type as you come down in to the town. We’d be taking that ‘slight incline’ out of the place. It was around midday, I’m sitting on 41 miles for the day and have arranged to be back in Glasgow for a 1.30-ish lunch. Not going to make 20-30 odd miles with that nasty hill to start in 90minutes, unless I can magically average 20+mph… So again, plan B kicks in, as Largs has a railway station. Annoyingly, I’m still feeling fresh-ish (unlike a fortnight ago where I was far from it) but time is against me, so a £7.20 ticket tucked in my jacket and I’m sat in the station waiting for the 12:56 to Glasgow. J&G head off with my best wishes to take that hill and I kick back and wait for my train. Me, Gio (there’s a theme here) and Ian. The idea was for a run around Renfrewshire – keep the Tak away from Ian for a bit to ease his nightmares. Tiny issue in that I wasn’t quite sure how long the route is. Probably about 50 (ish) miles. Not enough miles for Ian clearly, who cycled an extra 6 to mine. Let the games begin. The chosen route through Renfrew, Inchinnan and Bishopton is good to begin with as it means everyone is likely to stay together. A little bit of stretching out on the hills and back together again. 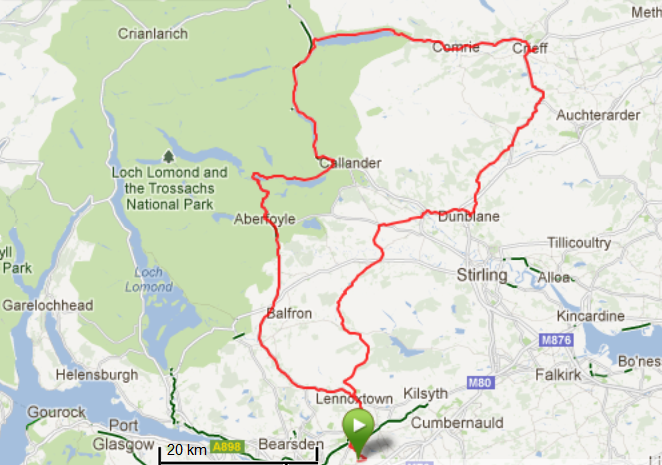 Not too bad in terms of hills until we hit Greenock and move up the Old Largs Road. How’s them legs now Ian? From this point Ian fell back just a little until the last fast 6 down into Largs. “Largs? That’s miles away”! 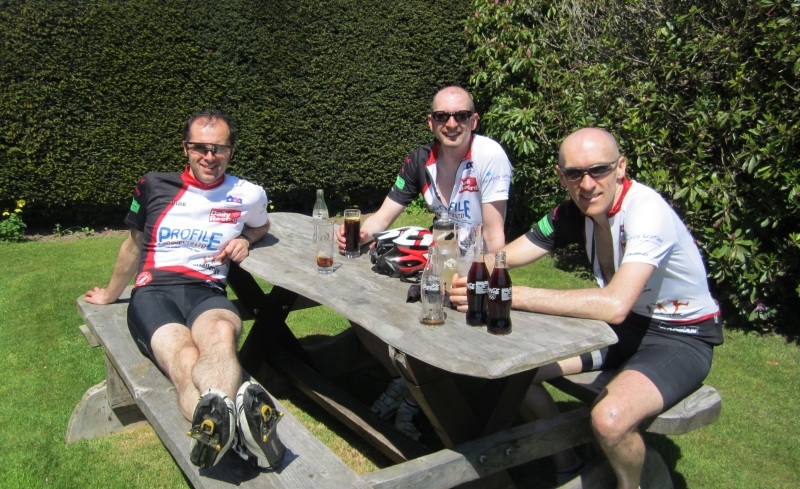 cried Ian, who had arranged a lunchdate (when will he learn – Sunday is for cycling. A dinner date sure, but lunch, leave it out). Anyway, down into Largs and a couple of calculations. Ian’s down 41 miles and he’s probably got another 21 to go (in reality another 30). The big fella is as fly as a bag of monkeys. He knows the Hairy Brae is around the corner and doesn’t fancy it. However, it shall be recorded that he had to bail out this time to meet up with his lunch mates. So packed the big chap on the Glasgow train and onwards for the rest of the team – all 2 of us. Up the Hairy Brae (what a name) and a new buddy, Brian, is having a breather. When he sees us coming he starts slowly moving along and once we pass, he clamps on the back. Now at this point my hands were seriously cold. I’ve either got to stop and spark a hand warmer or start turning the legs a little to get some heat going. Well, go on Brian. With his help, we got a right good train going and belted it back to Renfrew in double quick time. One chap did seem to lose a little puff and didn’t take his turn at the front so far. Not saying who, but his Garmin Connect monicker seems to have him listed as TheGtrain. Train? Ahem? More miles in the bag, but the legs feeling it a little this time. 1000 miles in 9 days? Not quite yet.